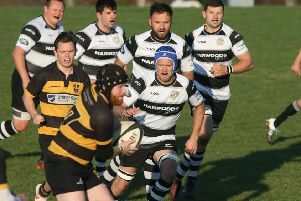 Horsham were praised for a ‘mature and controlled’ display as they consolidated second place in London 2 South East with another high-scoring victory. Tries from Marcus Condon, Declan Nwachukwu (two), Aaron Linfield, Michael Tredgett and Vince Everitt helped the Green and Whites to their seventh league success of the season. A perfect kicking display from Tom Johnson in putting over all six conversions and a further two penalties gave Horsham a 48-14 success over fifth-placed Dover. Head coach Nick Stocker said: “It was a strong first-half performance was backed up by a mature, controlled second half which saw Dover’s attempts at a comeback fizzle out. “The lineout and scrum were sound sources of possession and our ability to get over the gain line caused Dover trouble all afternoon. “Our ball carrying in particular from Jack Osgood, Mike Tredgett, Rich Tredgett and Vince Everitt was excellent. Condon set the tone as he scored inside two minutes after Horsham moved the ball well from the kick-off and Johnson kicked his first points of the afternoon. After a period of sloppy play, Horsham won a penalty deep in Dover’s 22 from a lineout and Johnson kicked another three points over on the 18-minute mark. Just two minutes later, Nwachukwu scored a superb solo try beating upwards of seven opponents ahead of Johnson’s extras. Jack Osgood was next to drive through multiple Dover players and Linfield deftly touched down in the corner. Johnson put over his fourth conversion of the afternoon for a 24-0 lead on 25 minutes. Young Everitt was next to demonstrate some powerful play and held off two Dover tacklers before swinging the ball out to Nwachukwu, who ran home for another converted try. The momentum swung back to Dover and they touched two converted tries to bring the score back to 31-14 before half-time, either side of Richard Tredgett receiving a yellow card. Early in the second half, an injured Jordan Smith was replaced by Michael Tredgett and soon after Richard Tredgett returned to put the Green and Whites back up to full numbers. Johnson added another penalty before a line-out produced a collective Horsham drive and lay-off to Michael Tredgett, who put down another converted try for a 41-14 lead. 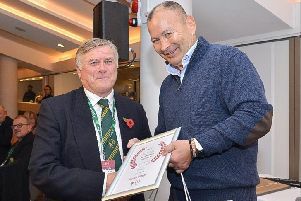 Everitt’s dominant running was finally rewarded at the death as he was able to break away from a Horsham scrum and beat a number of players – with Johnson again adding the extras. Horsham: Cass, Powell, Fairs, R. Tredgett, Osgood, Smith, Everitt, Redmayne, Linfield, Bell, Nwachukwu, Johnson, Wilde, Condon, Doubles. Subs: M. Tredgett, Barber, Clarkson.